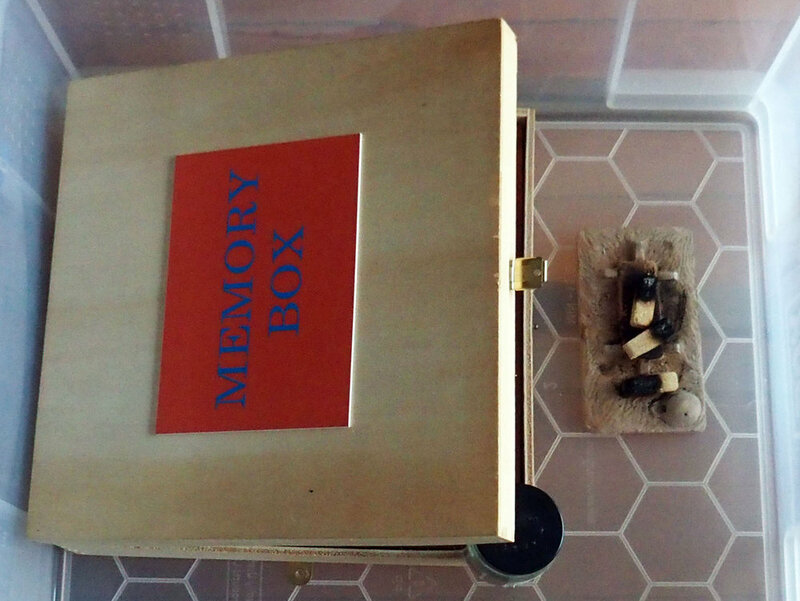 Memory Box is the second artwork we have made as part of our contribution to the Kakenhi funded Olfactory Art and Science Research project. This follows our first piece Viola Odorata (exhibited in Kyoto, June 2017 URL: http://olfactoryresearch.net/index.php/viola-odorata/ ). Memory Box was exhibited in the Maison du Japon, Paris, in October 2017, and continues the development of our research. The Viola Odorata display, which included a number of different elements that were combined to reveal connections between memory, narrative and smell, and we wished to evolve this further but on a more intimate scale with the creation of the Memory Box. We are also mindful of the need to consider how what we create might be interacted with by elderly people and those with neurological infirmities, and how the content of the art work could assist with memory association, combining olfactory, visual and tactile stimuli to achieve this. Viola Odorata encouraged physical interaction with an interactive touch screen display, visual elements to inspect (both graphic and written) and sources of smell to sample. However, the way in which these different elements were displayed conformed more to an exhibition context being presented as an array of separate but related elements. For the second artwork we wished to find a way to present diverse elements in a sufficiently compact form that could be experienced more intimately and in a more interconnected way. We began by considering the content and the container within which it could be presented. The stories that emerged when constructing Viola Odorata stemmed from the content of a letter, and we wished to continue to explore personal narratives and memories for this next work. For this purpose we decided to focus on a sense of place which evokes positive memories, and for both of us our travels in New Mexico and the Southwest USA provide personal associations that we have shared and enjoyed. A particular smell of piñon is also very evocative of this region, a pine wood that grows locally and is burned on fires in people's homes. It is also available as an incense. We decided that the artwork we would create should be small enough to hold yet capable of combining a number of elements that would represent our memories of travelling in New Mexico. A small wooden box (30 cms square and 9 cms deep) with a hinged lid provided this, and sits comfortably on a person's lap or side table to interact with. It once contained a cake so the box was always intended for domestic use and is not heavy. All of the materials used in the artwork construction are light in weight, combining painted polystyrene, foam board, card and wood. The action when opening the box also provides scope for inventing how a visual display might 'unfold' when viewed, and the pop-up books we have been familiar with since childhood served as a source of inspiration for this. Associations with childhood memories can often be strong and we both recalled many hours of pleasure spent playing with these physically interactive story books when we were young. In creating this Memory Box we have also rediscovered the pleasure of this experience. The pop-up construction allows for combination of several layers of images and creates a three-dimensional space that can be viewed at different angles encouraging engagement with the contents. 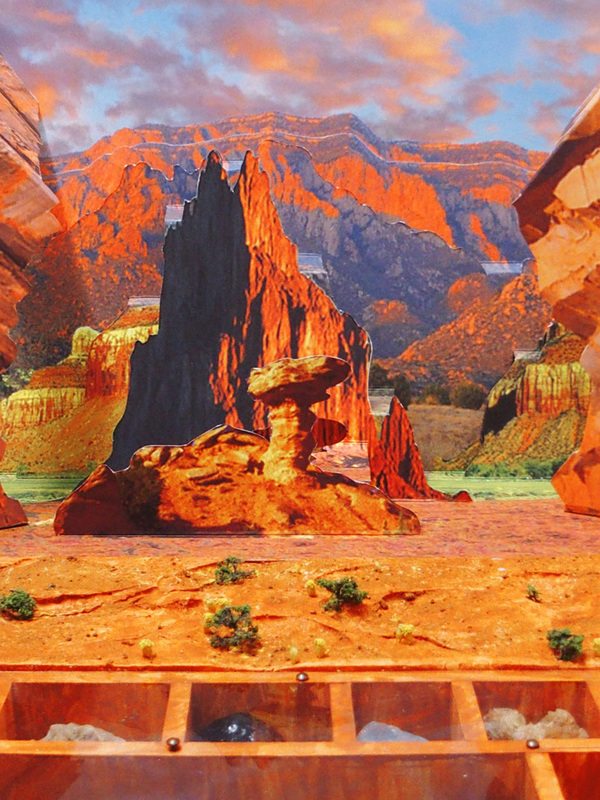 We selected a number of landscape vistas from photographs we had taken on our travels and superimposed these as layers of the pop-up construction which opens up as the box lid is raised, projecting the images toward the viewer as it does so. We also wished for the three-dimensional properties of the landscape to continue into the box itself, so this is constructed in miniature form, with small trees and bushes and a contoured surface extending the photographic surface into the real space of the viewer. The impression is of a landscape with real depth creating the illusion of a real space, enhancing the immersive experience and inviting closer inspection which brings the viewer into proximity with the source of piñon smell contained in the box. At the front of the box compartments contain a small collection of minerals, a dried red chile pod and a small glass jar containing piñon incense sticks. The minerals include two 'desert roses' of barite and selenite, an 'apache tear' polished obsidian that is semi-transparent when held up to the light, a calcite crystal, and a piece of turquoise. All of these minerals have regional significance, being found when walking through the landscape. The red chile pod is found across New Mexico in the late summer following the harvest, with long bunches tied to create ristras that hang from the fronts of houses as they dry in the sun. The chile is a regional delicacy, being slightly sweet and rich in taste and used to create wonderful chile dishes including enchiladas and carne adovada. Another source of inspiration for creating this artwork are retablos, usually box-like constructions depicting scenes of daily life and festivals made by artists in Mexico and South America. In our home we have a number of these folk art pieces collected over the years and it is remarkable how each contains a microcosm of the wider world. 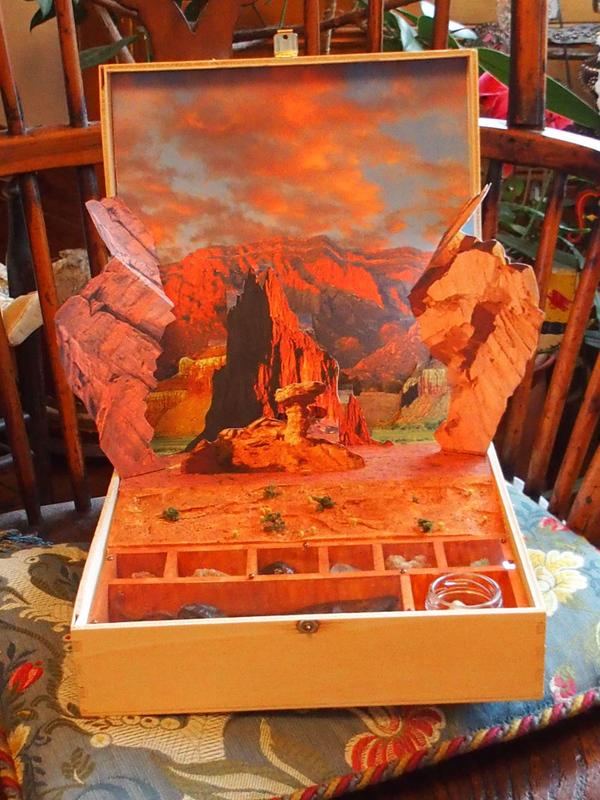 The Memory Box we have created provides a space to contain different images and artefacts that can evoke memories, and while we have chosen to present content that relates to our recollections of New Mexico, as this is a place that we have enjoyed many times together, there is the potential to personalize this relative to individual preferences. For example, family and friends could contribute material that could be used to compose a box that would promote positive memory associations for a particular individual, using a combination of their own imagery, artefacts and smell source(s) that they would relate to and could be stimulated by. There is a playful dimension to creating this artwork which he hope will render its form attractive to being interacted with. While for the purposes of the exhibition there is a transparent cover preventing handling of the rocks and chile it is intended that these would be accessible for an individual for whom the box would be made. Similarly, the small glass jar containing the piñon incense could be opened and the incense burned to enhance the olfactory sensation (for the purpose of the exhibition the Memory Box was smoked in piñon in advance although this does not fully replicate the intricacy of this olfactory source). Layering of multiple photographs also enables the creation of a composite image resulting in a collage combining a number of related memories with the potential to stimulate recognition and positive associations for the viewer. Initially, we did discuss incorporating a digital component (flat screen) within the construction but as the artwork evolved we decided that the immediacy of using materials on this scale that do not demand an interactive graphic user interface to be comprehensible and that are permanent in their form would be preferable for what we intend this artwork to achieve. That it is also intended to be responded to by those with mental and/or physical infirmity was also a consideration in making this choice for this particular artwork although we will be investigating the potential for including digital components further in the next pieces we construct. We are engaged in an investigative process that will continue with future exhibitions of artwork exploring the themes of the project and our research.